Come join us this thursday for the last EAVI for a few months! It will be a blend of immersive electroacoustic music, glitched up vocal electronica, experimental pop, new instruments and a personal exploration of Soviet history through archive recordings. AGF pioneered a unique style of vocal and beat driven electronic music that stands as a major influence on many of today’s practitioners in electronic music. She has released on her own label, AGF Producktion, as well as Kitty-Yo, Line and more. Her music blends electronica, dance and pop into a heady and compelling blend to make both brain and body dance, and her recent work has lead her to the curation and practice of outdoor performances which engage with the unique aesthetics of sonic wilderness. Simon Emmerson has been at the forefront of computer music and its techniques, as both a theorist and practitioner, producing and developing electroactoustic and tape music throughout his extensitve career. He will be performing ‘Digswell Tapes Remix’. Expect extra speakers, short-wave radio glitches and a truly immersive sonic experience. Sandra Ka presents an open-ended exploration of discovered archive material, found tapes, field recordings, voice, hidden ambiences, and more. Constructed, mixed and manipulated live, sonic elements from the soviet past are conjoined with the present. The final story will be biographic, told in a partially organised, partially improvised form. 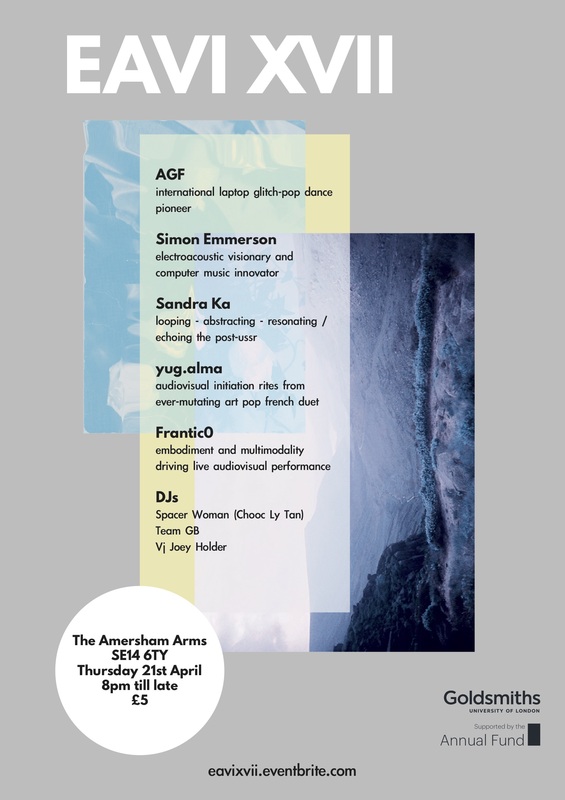 The duo yug.alma will perform a set that blends electro, pop and rock whilst drawing on new musical technologies, combinging modified vocals, gestural controllers, guitars and more, drawing on Hugo’s (of yug.alma) research alongside other work in the EAVI research group. In his practice, Francisco Bernardo aka FranticØ uses gesture and body expressivity to drive audio and pixels, using a set of custom made designs that combine mobile apps, new combinations of sensors, and video projection. Francisco is a researcher in EAVI, developing and exploring new ways of turning novel technologies into expressive musical instruments.